Should We Strive for More Generalists and Fewer Specialists in Education? I’ve been thinking about generalists and specialists lately, and I’m beginning to think that the education field has fetishized specialists and forgotten about the value of generalists. [Asaf] showed me studies demonstrating that states with higher ratios of primary-care physicians have lower rates of general mortality, infant mortality, and mortality from specific conditions such as heart disease and stroke. Other studies found that people with a primary-care physician as their usual source of care had lower subsequent five-year mortality rates than others, regardless of their initial health. In the United Kingdom, where family physicians are paid to practice in deprived areas, a ten-per-cent increase in the primary-care supply was shown to improve people’s health so much that you could add ten years to everyone’s life and still not match the benefit…. Further, the more complex a person’s medical needs are the greater the benefit of primary care. Observing the care, I began to grasp how the commitment to seeing people over time leads primary-care clinicians to take an approach to problem-solving that is very different from that of doctors, like me, who provide mainly episodic care. The summer issue of The Washington Monthly gave more evidence in the case for generalists through Samuel Jay Keyser’s personal story: a sophisticated surgical procedure saved his life, but a team of generalists really helped him take steps toward a productive life. I find these arguments compelling. Both Keyser and Gawande point to the growing body of research that health care patients are often better off with a close relationship to one generalist than they are to a poorly coordinated network of specialists. We see this especially in end-of-life care. Patients with hospice and palliative care live longer and cost less to keep alive than those who receive the usual cocktail of specialists and hospitalizations. Education, however, keeps trending in the opposite direction. There’s been an ever-increasing push to ensure teachers are given specialized training and licenses to fill specialty roles within schools. As a field, we’ve been operating as if more and more specialization will be a good thing, but hardly any of this is linked to actual outcomes for kids. Still, that hasn’t stopped us. There’s very little evidence behind the specialist trend, and one study I’m aware of points in the opposite direction. When Houston experimented with creating specialized teacher roles in elementary schools, the generalist elementary school teachers who spent all day with their students helped their students learn more than their peers who specialized in only one subject. The author of the study theorized that the generalist teachers who spent more time with their students could better tailor their instruction. We also see this in other studies of teacher credentials, where deeper content knowledge is far from a guarantee of more effective teaching. To be sure, there are some elements of schooling where having a specialist is clearly better. If one of my children was being tested for a hearing or learning disability, I’d want a specialist to perform the test. But from my conversations in the education space, I’m worried we’ve taken this concept too far and applied it to everything a school does. Whether that’s a good thing or not is worth further investigation. This entry was posted in Politics of Education, Research, School Leadership, Teacher Effectiveness and tagged Teacher certification, Teacher licensure, Teacher Preparation, Teacher Professional Development on September 29, 2017 by Chad Aldeman. Last week, my colleague Andy Smarick weighed in on the conversation about TNTP’s report, The Mirage. Andy questions if TNTP’s findings about teacher professional development—in short, that the system is largely failing—are accurate. That’s because the measure that TNTP used to track teacher improvement is teacher evaluation systems. 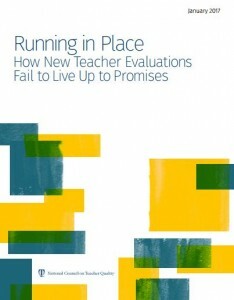 Although TNTP looked for improvement on a wide range of multiple measures including summative evaluation ratings, classroom observation scores and value-added scores, Andy rightly challenges the measure because teacher evaluation systems on the whole lack the ability to accurately assess teachers’ knowledge and skills. Let alone teachers’ growth. Or even more, if or how the kinds of supports and trainings teachers’ receive lead to any kind of improvement in their practice. Andy caught the eye of TNTP’s CEO, Dan Weisberg, who wrote in response that evaluation systems don’t have to be perfect to give meaningful trends about teacher improvement or lack thereof. 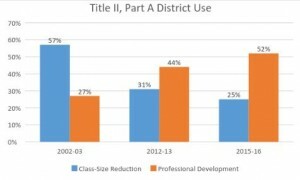 So, Dan argues, we need to at least try to measure the impact of professional development. Andy and Dan are both right. And their back and forth represents an important, ongoing, and frustrating conversation about how to measure teacher effectiveness and use the results to improve teacher practice. This entry was posted in Education Policy, Teacher Effectiveness and tagged Teacher Evaluation, Teacher Professional Development on October 6, 2015 by Kaitlin Pennington.